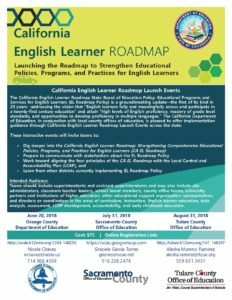 Allison Briceño: What does the English Learner Roadmap mean for teachers? 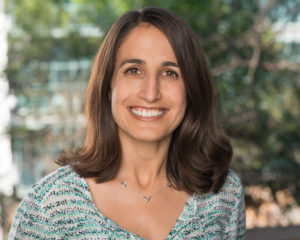 In this article, Allison Briceño, one of the fellows in our English Leadership & Legacy Initiative (ELLLI) answers the important question: What does the English Learner Roadmap mean for teachers? 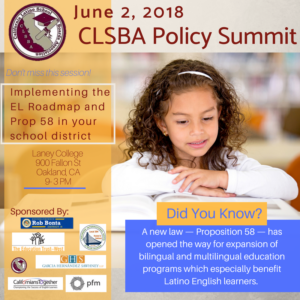 Californians Together, in collaboration with the California Association for Bilingual Education (CABE), has developed the EL Leadership & Legacy Initiative (ELLLI) as a three year effort that will initially result in a group of nineteen new English Learner (EL) education advocates/leaders. The EL fellows will be equipped to advance proactive projects as well as to respond effectively to anticipated political challenges at state and local levels. In addition to the preparation of selected cohorts of new EL leaders, the project aims to make more widely available an EL leadership and legacy curriculum that can empower many other leaders at the local, regional and state levels. The project will draw on the perspectives of many senior EL leaders, and current advocates for ELs and will use a blend of whole group training insinuates, one-on-one coaching and mentoring and project based experiences. Ed Source: Bilingual education advocates celebrate first new policy for English language learners in 20 years.